"Everything we have today has been fought for by people just like us, who came together, and sometimes died for each other, to give us decency and dignity." This week we are back in radical Manchester to discuss how we build our industrial strength, grow our numbers and expand our political influence. But also to celebrate, and take strength from, our forefathers’ efforts. In 1817, 10,000 weavers and spinners met in Manchester with blankets, rugs and coats wrapped in bundles under their arms. They planned the Blanketeers’ March to London to draw attention to the poverty from which they suffered. The King’s Dragoons were sent in to disperse the meeting, which they did, violently. Still they marched and were attacked a mile after they set off, bullet wounds and sabre cuts inflicted. In 1819, again in Manchester, 60,000 people gathered to demand parliamentary reform, a vote that counted. At least 15 people died at the Peterloo Massacre. In 1834, six agricultural workers in Tolpuddle swore an oath to support each other. They were sentenced to penal transportation to Australia for their crime. In 1882, the socialist and anti-fascist Sylvia Pankhurst was born in Manchester, and struggled for years for women’s suffrage. In 1888, women workers at Bryant and May went on strike for better, safer, terms and conditions. In 1900 in Taff Vale, over 1,300 workers went on strike in solidarity with a victimised colleague. The courts held the union liable for the company losses. It doesn’t matter which year, which place, which industry, there will always be employers or government, often both, saying no. But there will always be people, trade unionists, workers who will say yes and be willing to fight. We are the trade union movement. We are powerful agents of change. We don’t observe history, we make it. Imagine what it must have been like in 1868 – the TUC’s founding year. Standing with each other for the first time, different industries and skills, to make common cause. Twenty years later those ‘match girls’, some as young as 12, worked 14 hours a day on their feet six days a week. They were forced to buy their own equipment and got phossy jaw, which rotted the inside of their mouth. They refused and one of them was sacked. That was meant to shut them up. But instead they walked out, and didn’t go back until they got her back, got time off, and got a complaints procedure. In the meantime, the TUC was meeting, unions were growing stronger, they were organising. In 1906 they got their strongest vote in parliament and one of the first things they did, those trade union-supported MPs, was to pass legislation turning back Taff Vale and making it illegal to use white phosphorus that had rotted the jaws of those young women. So when we look at the many challenges we have. When we are told we are worth less, that we must work harder, that we must accept less security. We must remember that none of that is new and none of that is stuff we cannot deal with. We have done it throughout our history, and we must do it now. 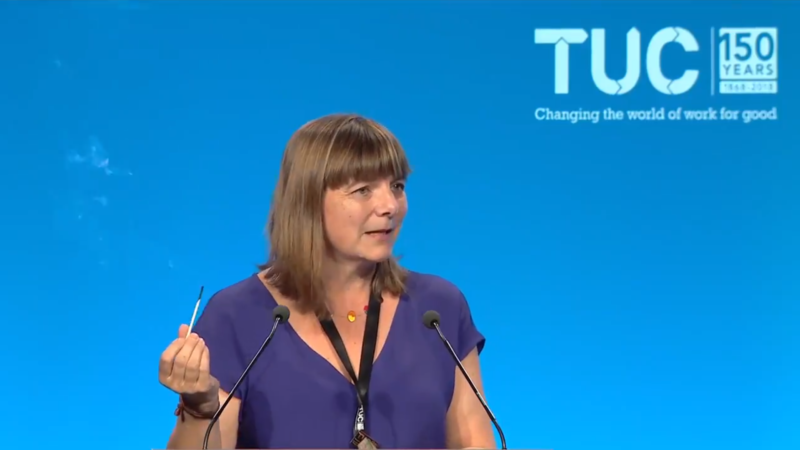 Sally Hunt is General Secretary of the University and College Union and outgoing President of the TUC.